Or, "I Make Up for Three Weeks of Blog Absence By Uploading a Bunch of Pictures, Most of Which Don't Even Have People In Them"
The first picture is a selfie, but that's pretty much all I've got for you. Hello again, people! It is coming up on 7:00pm on the last day before the last day of vacation, and I am (for once) updating in my apartment instead of a brightly lit classroom full of squirming freshmen. Those little munchkins are making their way back to the dorm tonight after two weeks of freedom and celebration with their families, and I think I'll miss the quiet of an empty Sulafat but I'll hopefully soon rediscover the thrill and excitement of having a dozen barely pubescent neighbors. It's been a great vacation, though! A week of LOTS OF THINGS was followed by a week of almost nothing, in proportions that seem to have evened out well enough to leave me reasonably rested and reasonably prepared for the school weeks to come. I'm usually not one for vacation updates (isn't hearing about Jordan what you all pay me for? ), but this one is a birthday present for Nana, so enjoy the photo safari of my Big Balkan Vacation! Adventures began during a 6-hour layover in Istanbul, of which I took full advantage. Note my enthusiasm at having successfully left the airport and found Galata Tower (it wasn't hard), despite operating on 2-ish hours of sleep at 7:00 in the morning. The spice bazaar wakes up. 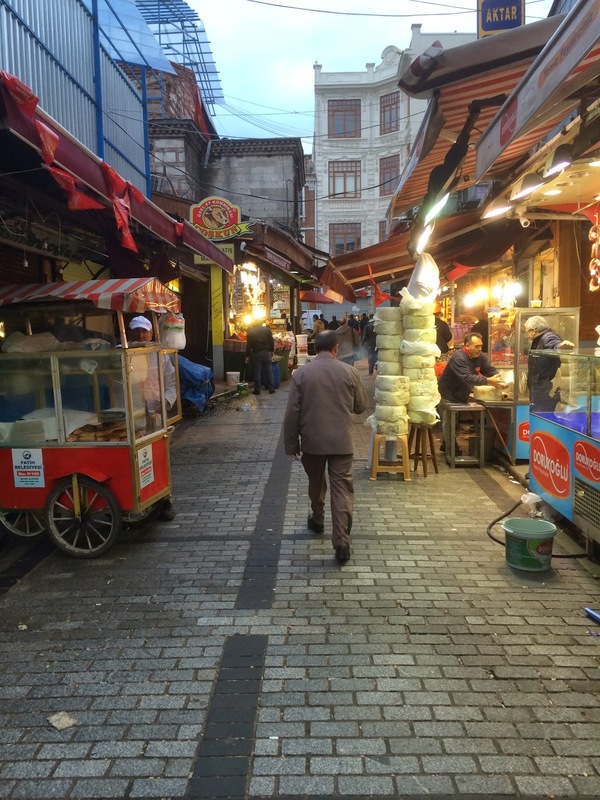 Because what was I going to do with three hours in Istanbul besides retrace the steps of my food tour for a third time? 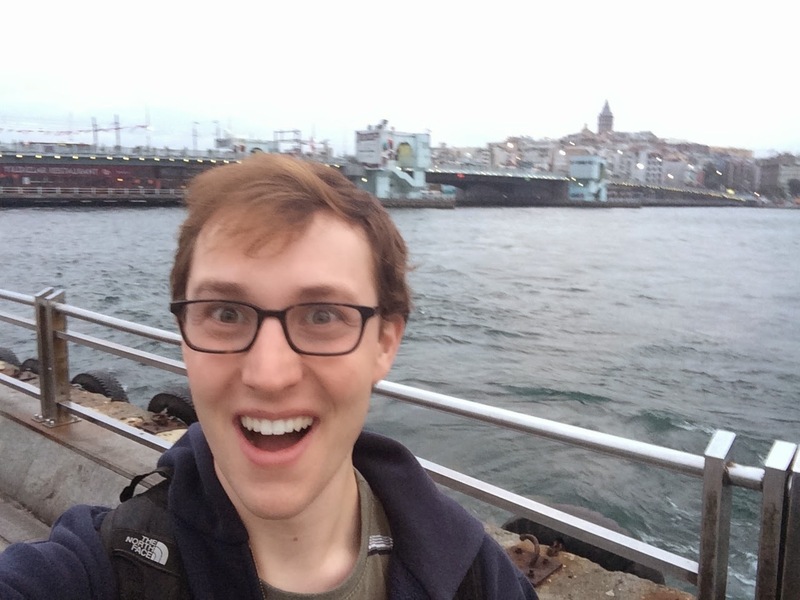 Then I got a haircut, and then I got back on the plane, and it took me to a place called Podgorica in Montenegro, and I was picked up by Eli, Harvey, and Nick! They had come to collect me after a wild week in Munich and elsewhere in Montenegro, and as soon as I was in the car, we were off. First, across lovely Lake Skadar for my first taste of Montenegro's eponymous beauty. 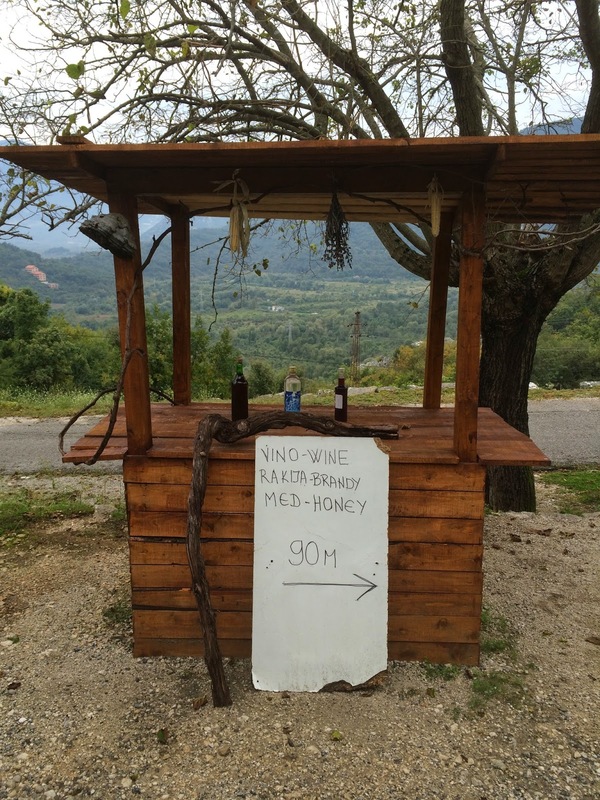 Within about a half hour of arriving, we stumbled upon a family vineyard selling homemade wine, brandy, and honey. They spoke enough English that we were able to do great business, and also had some cute cats. Good start to the trip, to say the least. Late that night, after a dinner stop in Cetinje drive down 25 spooky mountain switchbacks (check the Google maps road for proof! ), we arrived in Kotor, which is not named for the Star Wars video game but is certainly sufficiently impressive. We hit the town in the evening after becoming better acquainted with this Eurovision hit. It immediately became the theme song of the trip. A view from the next day, as we ascended to the fortress of Kotor with the lovely Cruise Ship of Kotor beneath us. View from the descent. Construction worker, I guess? The old city of Kotor is completely contained within a triangular castle that abuts the mountain we climbed to reach the fortress. It looks as majestic and imposing from sea level as it does from up here. Next stop: Dubrovnik! Having already been, Eli and I figured we could revisit some old haunts while Nick and Harvey explored the city walls. We stumbled upon the Jewish museum by chance and asked about Yom Kippur, which had ended the previous night. Apparently, 80% of the 45 Jews in Dubrovnik are women, which means they don't have enough for an Orthodox minyan, so nothing happened for the holiday. It was great to get even a small glimpse of the local Jewish culture, though. Look familiar? It's the rock that Eli jumped from during Whiff year! He did not attempt a two-year reunion jump, and neither did I. The pirate ship is a bonus. Another day, another country: Bosnia ahoy. This is the totally epic bridge of Mostar, destroyed by bombing in the 90's but rebuilt through the combined efforts of a bunch of European countries and banks. Totally worth it; it was gorgeous at sunset. And last but not least: Sarajevo! My trip ended as it began: a solo excursion in a cool city (the other guys had an earlier flight than I did). Here's a view from one of the steep hills surrounding the city. So I walked and walked, checking out mosques and churches and synagogues and plenty of foods. I took a nap on a park bench, and snapped this photo of the point at which Sarajevo's western and eastern "old city" areas meet. Clearly, they are aware that this is of interest to tourists. 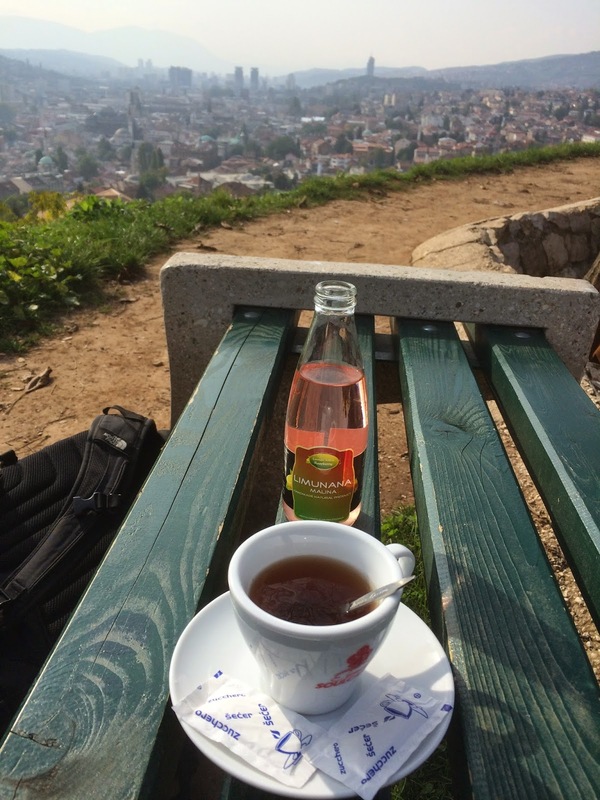 Up another hill for tea and a book until the call to prayer resounded from hill to hill. It's a beautiful city, like a mini-Istanbul in its diversity, and I was really surprised (pleasantly so) by the vibrant buzz of a city that was so recently torn up by conflict. Everyone we met, from hostel owners to shopkeepers, seemed very optimistic about the future of the city and the country, and I feel like I haven't seen the last of Sarajevo. I sure hope not, anyway. That food was delicious. And last but not least, the whirlwind tour of Jordan! My flight arrived at close to 4 in the morning, and after sleeping in at King's, it was immediately off to Wadi Rum. Here, Nick and Harvey climb a dune. We thought some of our photos were good enough to be publicity shots for Suleiman. He was, as always, a great guide in the desert, and we had a very relaxing evening out on the dunes and under the stars. Petra, of course, which never fails to disappoint. We were there until it was pitch dark, then drove immediately to Amman to meet Harvey's cousin at a bar. I don't know if I've ever been so exhausted. But I don't regret it: always good to have new adventures, especially when touring people around. Plus, I had a whole week to recover. And did I recover? Let this picture stand as a testament to the fact that I at least baked a ton of muffins. This (apple) was the first batch, which I made for our Survivor catch-up/Canadian Thanksgiving-themed Happy Hour. Today (peanut butter) was the second batch, which I made for our Board Game Brunch. Sound ridiculous? Every day was like that. Parties, cooking, restaurants, Chase's birthday, games, and the occasional thought of school have dominated the week, and I think I feel sufficiently vacationed out and ready to start back up. Tomorrow I proctor the PSAT at 8am, which will definitely get me on my feet whether I like it or not, and then it's off to the races. Hope you enjoyed the little Balkan photo trip! I'm realizing that after being gone so long, it's going to be nice to get back in the classroom with my students and remember why I like this job so much in the first place. Hanging out with friends is fun, but you can do it anywhere, and I suppose I'm looking forward to a return to the hustle and bustle. We'll see how long that lasts.